As the innovator and world leader of polyethylene table and chair technology, this line features products with superior strength and durability at an exceptional value. Lifetime folding tables and plastic chairs are constructed of high-density polyethylene and are stronger, lighter, and more durable than wood. 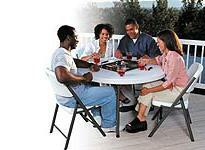 Lifetime outdoor tables will not crack, chip, or peel, and are built for indoor and outdoor use. The Lifetime folding table patented steel frame design provides a sturdy foundation and is protected with a powder-coated, weather-resistant finish. These tables are built for the rigors of demanding commercial use. Folding tables exceed challenging BIFMA standards. (Smaller-sized tables do not exceed BIFMA standards). 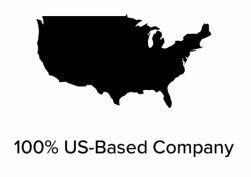 Most of Lifetime's tables are manufactured in the USA and backed by a ten-year warranty. View Lifetime Tables for Sale. Advantage and Accent Lifetime Plastic Table Products were replaced by the Lifetime Folding Table line. Perfect for the home, on-the-job, and the garage, Versalite tables are constructed of easy-to-clean polyethylene and a durable steel leg system with reinforced support legs. Versalite folding tables feature a contemporary design made of easy-to-clean polyethylene. The tables will not crack, chip or peel, and are built for indoor and outdoor use. The Lifetime table durable steel leg system provides a sturdy foundation and is protected with a powder-coated, weather-resistant finish. Versalite Folding Tables are lightweight, manufactured in China, and backed by a two-year warranty. Where can I purchase a Lifetime table or Lifetime chair? Visit www.competitiveedgeproducts.com to purchase Lifetime products online. What is the warranty on the Lifetime table? Warranty depends on the actual product, as well as the product line. Where is the model number that I need to register my product? Often times the model number will be stated on the product label, near the UPC. In addition, the UPC code is 12 digits long. The four numbers given as the eighth to eleventh digits are the model number. What is polyethylene and why is it better than wood? Polyethylene is a plastic that is virtually indestructible. It will not chip, crack or peel like particleboard laminates. These provide many advantages wood just can't offer. Polyethylene is more durable, easier to clean, lightweight, and is ideal for indoor and outdoor use. The rounded edges will not cut your hands and provides a great handle for carrying. What makes the steel legs weather-resistant? The manufacturer uses a powder coating process on its steel which coats a bare metal object with electro-statically charged powder. It is then baked at a high temperature. Powder coating is the most durable coloring process on the market. It is better than traditional paints. 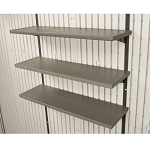 The manufacturer also adds a hammer-tone finish which is a textured powder-coating finish that is better and more durable than smooth powder since it is resistant to scratches. What is BIFMA and why is it important? BIFMA stands for Business and Institutional Furniture Manufacturing Association. BIFMA sets industry standards for commercial grade furniture. Lifetime table exceeds all BIFMA standards. They meet BIFMA standards for strength and durability. All products left out in the sun for extended periods of time will eventually fade. However, UV inhibitors help prevent fading and maintain the integrity of the polyethylene when exposed to sunlight providing years of color. Even the toughest of stains such as red punch, permanent marker, mustard and motor oil could not stain the tabletop. The only products you need to clean the Lifetime table are a damp cloth and mild dish soap. For tougher-to-remove dirt, use a mild abrasive such as Soft Scrub and a soft-bristle brush.